Home » Articles » Pace Yourself! Important points to check when selecting either a summer camp with swim lessons, or a year round swim program. What better way to spend the summer than developing an important life skill and having fun doing it? Swimming is an important safety skill that can be enjoyed for life! 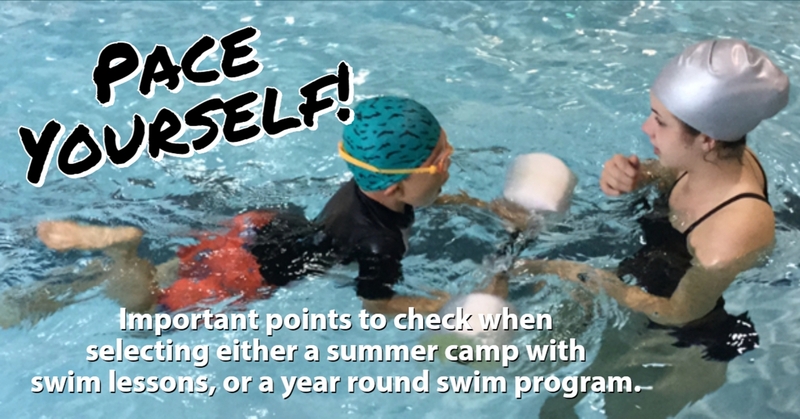 Following are important points to check when selecting either a summer camp with swim lessons, or a year round swim program. Do the lifeguards follow the American Red Cross Program, practice their skills on site as a team so they are prepared, knowledgeable and confident in the event of an emergency? Does the camp incorporate safety into their swim lesson program, teaching and demonstrating safety in and around water? A friendly and energetic staff makes the learning fun! Younger campers will benefit from safety habit development like "Reach and throw, don’t go" or “Look before you leap”. Older campers may learn lifeguarding skills giving rise to leadership skills that last a lifetime. When a camp follows the American Red Cross’s Levels of Swimming, campers are grouped by age and similar skill set to provide logical progression from first wet feet- all the way to competitive racing! Progress reports, skill sheets, and general expectations track each child’s progress and should be communicated to Parents and Guardians, so kids exit camp stronger and more advanced in their abilities. Instructor to student ratio should be carefully managed- no more than 4:1 for beginning levels and 1:6 for more advanced and competitive swimmers. Children typically spend 45-minutes to two hours in the water depending on intensity and level . Look for a program that offers Independent exploratory swimming or "free swim"- this should not be underestimated! Bonding with friends, and freedom to swim independently has many rewards! Although children can develop skills in a smaller facility, a 25-yard pool with both deep and shallow ends, and a diving board is key to satisfying all children’s levels, interests and goals. Shallow pools eliminate the experience of learning all important water safety life skills, as well as the ability to swim independently in community and home pools, and certainly in open water. Accomplishment of yardage, increased confidence, mental focus, and cardiovascular stamina are some of the many benefits. Through safety lessons and fun exploration, diving can be an excellent motivator for the timid kid! And a facility large enough to have a program that can introduce confident and advanced swimmers to preliminary lifeguarding skills is a big plus! Campers also need time to “dry out” and “get out”. A good swim camp should build a variety of land activities into each day. Field games, fitness and other special activities build strength and increase the fun quotient. Disguising core strengthening activities with fun has big benefits in the water. A mature aquatic and coach staff are critical to a great swim camp program. Look for a program with seasoned American Red Cross Water Safety Instructors with expertise in various teaching levels. Coaches should not be hired only for their teaching and lifeguarding talents, but also as role models and for their proven experience and skill in working with young children. And they need to make it FUN! Learning happens much more readily when it becomes a game and the swimmers are having fun! Connections are made between swimmer and staff that make the children feel special, and they look forward to swimming! Parents should notice improvement in their children's swimming abilities and overall confidence in and out of the water. Your children will build friendships and have fun while gaining a lifelong skill, and will end their summer having earned a true sense of accomplishment!